The ideal food for taming your fish. 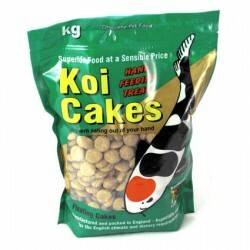 These Kockney Koi Cakes 1kg are floating hand feeding treats t..
For all pond fish and Koi	The Nishikoi Natural Range of Treat Sticks are a healthy blend of ingred..
NEO intex literally means: natural, energy-optimised nutrition. Behind this lies the ratio of prote.. The ideal food for taming your fish. These Kockney Koi Cakes 2kg are floating hand feeding treats t.. Turbo growth booster, contains 56% protein. Silkworm pupae are one of the richest natural sources o..